On Monday, the world got its first look at iOS 6 after it was officially announced by Apple at this year’s WWDC event, and of all the features anticipated and discovered, the replacement of Google Maps with the new, Cupertino-engineered offering was easily one of the most exciting. Not so joyous, however, if you run one of the older devices, for in quintessentially-Apple fashion, the iPhone 4, 3GS and iPod touch 4G were uninvited to the 3D party. Of course, as was the case with Siri back in October, it has been deemed as a ploy to sway consumers towards the newer, pricier iPhone 4S, and although many wouldn’t consider 3D maps to be a deal breaker, it remains a bit of a disappointment that Tim Cook’s company decided to omit the long-serving duo. Still, whenever Apple throws a spanner in the works, there are invariably a few hackers and developers ready and eager to offer a solution in what has evolved into a long-standing cat-and-mouse. On this occasion, the remedy comes courtesy of Apple-bent Russian site iGuides, or specifically, member Anton Titkov (known as iTony), who has dug deep into the brand-new firmware version in order to attempt to unlock the 3D capabilities on the A4 based devices. Much like Siri, which was successfully cloned and ported through to other devices (most successfully via jailbreak tweak Spire), Titkov has made some promising inroads, boosting the prospect of 3D maps following the precedent set by the voice-recognition implementation by eventually working in full on the older device, whether Apple likes it or not. One caveat at this point in time seems to be turn-by-turn, which our friend iTony is having a bit of trouble getting to grips with. Furthermore, if you’re on an iPhone 4, 3GS or iPod touch 4G and wish to give it a whirl, the process is more complicated than usual, since iOS 6 cannot yet access Cydia. Installing a .deb file is usually a ten second process thanks to the jailbreak Mecca that is Saurik’s Cydia infrastructure, but until a proper jailbreak is released for iOS 6, any installations are going to require a little additional leg work. 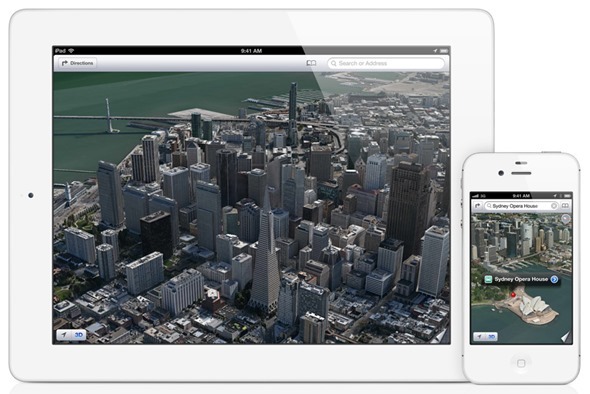 We’ve provided a short guide on how you can bring 3D Maps to your iPhone 4, 3GS, and iPod touch 4G which is posted below; although given the slightly trickier nature, we cannot stress enough that you should proceed at your own risk, since the chances of something going wrong are naturally higher than usual. Note: You need to first jailbreak iOS 6 beta on your device using Redsn0w. It must also be noted that you should download iOS 6 beta legally from iOS Dev Center only. Step 1: Download the required .deb from the source site here. Step 4: Ensure you respiring (or, to be safe, reboot) in order for the changes to take effect. Considering the announcement was only made on Monday, this is a very promising start, and those looking for a fully-featured iOS 6 on their older device needn’t be too downhearted.